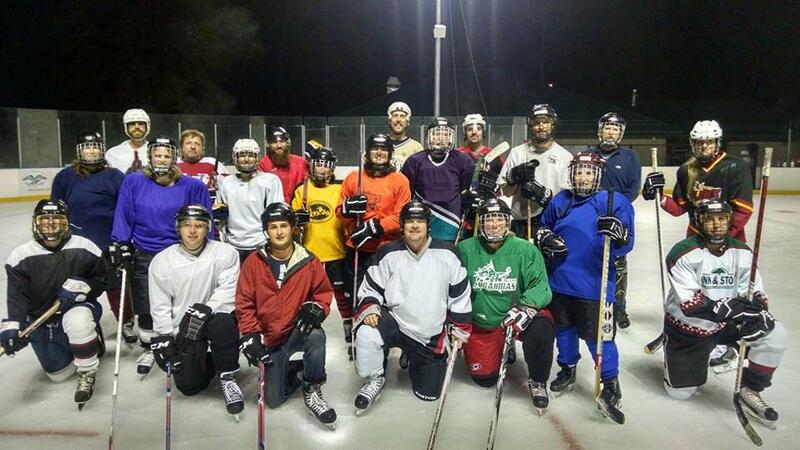 The Rookie Adults Program is designed for adults with very little or no previous organized hockey or skating experience. Rookie adults are people who can't skate, can barely skate, or skate a little and want to learn to play hockey. We will focus on skating, basic hockey skills and concepts of team play. These sessions are coed, non-contact, and they are a fun way to learn the sport of hockey. A helmet is required and a half shield or full cage is recommended. Protective shin pads, elbow pads, hockey gloves and hockey pants will be required by the third session. Limited rental gear is available on a first come first serve basis, and some equipment is available for sale. Instructors will be available at the first session to help players properly put on protective gear and will have advice for the how and where to purchase new and/or used gear. Weekly practices are guaranteed 60 minutes of on-ice time. Practice day and time will be Thursday nights starting at 8:45. All practices will be in Kalispell at Woodland Ice Center. Two sessions expected, each session is 8 or 9 weeks long depending on start date, with one refereed game at the end of each session against league players. At the end of the first session skaters can join either the WAHA Women's league or the Co-Ed "C" league that begins in January, or players may continue on for another 8 weeks instruction. Game play will be slowly introduced as players' skills develop. Coaches are experienced hockey players and coaches who have USA hockey training. Safe, friendly way to learn to skate and play hockey.